"Home is not a place, it's a feeling" - true to this motto, my team and I will do our utmost to make you feel "at home". We look forward to seeing you! The certified 4-star hotel offers comfortable non-smoking rooms, 7 conference rooms for up to 180 people, a restaurant, bar with Sky Sports, terrace, 167 parking spaces, free fitness room and free WIFI throughout the hotel. Our hotel shuttle operates daily from 5:00am to 11:30pm to Düsseldorf International Airport and back (charge applies). Düsseldorf exhibition center and the cities of Düsseldorf and Essen are within easy reach of the hotel. The Mercure Hotel Düsseldorf Airport is situated in a peaceful location near Düsseldorf airport and the regional capital. The Düsseldorf and Essen exhibition centers can be reached quickly thanks to the nearby Breitscheid motorway exit. 18 million people live in the area around Dusseldorf airport: The region boasts the third largest GDP in Europe and is the seventh largest economic area in the world. DUS is the most important airport hub for this region with 70,000 passengers daily. 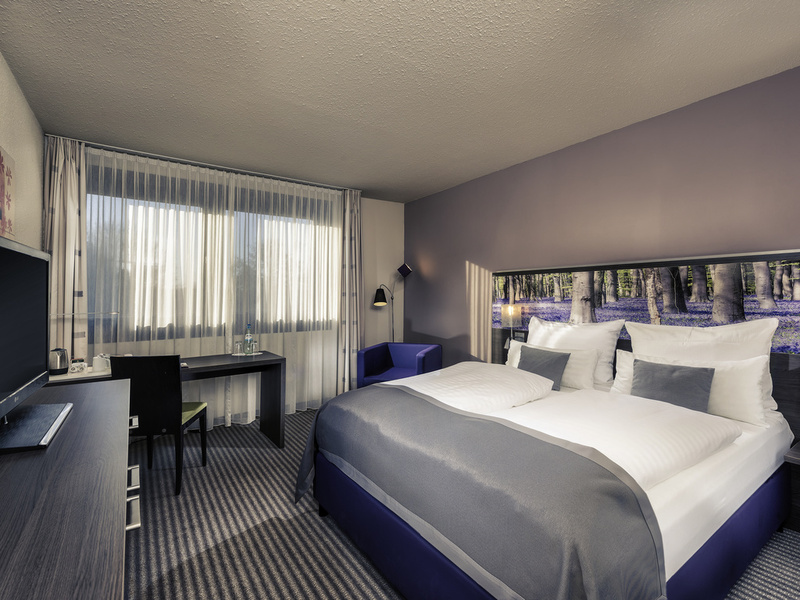 At the 4-star Mercure Hotel Düsseldorf Airport you can choose between Standard Rooms with a queen-size bed or twin beds and Privilege Rooms with a queen-size bed. We recommend our Family Rooms for your family breaks. We have two rooms suitable for guests with reduced mobility. All 120 rooms have free WIFI. A child aged up to 12 years may stay in their parents' room free of charge. Your pet is also welcome (charge of EUR 10/night). Our contemporary Quecke restaurant serves international specialties. Come and enjoy the cozy atmosphere and relax on the sunny terrace. The restaurant is open for lunch from midday to 2pm and dinner from 6pm to 10:30pm. The Kornkammer bar will entice you with its contemporary design and provides the perfect atmosphere to unwind. Visit us from 7am to midnight and order your favorite cocktail, a cool beer or a glass of fine wine. Hotel is not at Dusseldorf airport, and taxi drivers need the full address, to find it in Ratingen, Murcure Hotel is a friendly, well run hotel, in slightly remote location, handy for the autobahns, rooms and food are good quality, English speaking friendly. Location is convenient to go to Messe and airport if you have a car. The hotel is nice, room was clean and quite, breakfast was OK, the team was really nice. The only problem was the wifi: really poor, difficult to connect, super slow. Old hotel. Unfriendly staff. Shuttle from and to the airport to be paid. Extreme long waiting time for the shuttle and no indication given on the reservation or website that and where you need to order the shuttle. The hotel is far away from the airport in the middle of nowhere and there is nothing around. Dear Guest, Thank you very much for letting us know of what went wrong during your stay, so we get a chance to learn from it and make it better. I'm sorry to hear that you find our staff unfriendly. It would be very helpful to learn more detailed about it in order to find right person to address and to take appropriate measurements. I'm sorry, that you didn't know about how our shuttle service works. Next time if there are any questions or ambiguities please feel free to contact us for any information, we will be happy to assist. Since our shuttle is driving every 30 min, wait time can be up to 45 min, depends of where the shuttle was at that time. I’m sorry that you had to wait so long. Best regards Ludmila Z.
Dear Kenan, Thank you very much for reviewing your stay at our hotel. We are happy to hear that our staff has given you a good support. This is correct, that our parking, which is monitored by video, costs € 6 per day. Due to the installed parking system, which is regularly maintained, it is possible for us to provide our guests with secure parking directly at the hotel. I can absolutely understand your point in terms of flies. Since our hotel is located in the country side of Ratingen, there are many horse farms in surrounding area. This is where all these flies coming from. We did already anything we can do to keep flies outside. We installed insect screen on windows, implemented UV light fly traps and much more. But no matter how many anti-fly weapons we use, we’ll never kill every last one. That's why we always keep the food covered. Best regards Ludmila Z. Very nice friendly staff. Good food, and pristine room. All in all, a very nice and convenient place to stay if you have an early flight out of late flight in to Düsseldorf airport. Not so easy to find from the Main Street if traveling by car. Stayed there for one night during a layover flight. Further away from the airport as anticipated (15 mins by car) and as the shuttle does not operate past 23.00 had to take a taxi which was 40€ one way. The shuttle service in the morning was only 12€. Staff very friendly, professional and made me feel welcome. Room clean, bed comfy. Price very good. Corridors and lift could do with a make-over, look a little neglected. But would stay there again, if my flight times were within the shuttle running time. More than the stop to go back home. Dusseldorf is an amazing city, with lots of places for visiting and enjoying. The hotel is only a little bit far from fhe city. It is not so closed to the airport either: 14 km. Very good for the price..only if you have a car. Good validación for Money. Good restaurant. Location difficult to get there in between Many highways. Nice rooms. Nothing nearby, only other hotels and industries. Good hotel for the break and rest beetween two flights. Hotel is located not far from the Dusseldorf airport and Dusseldorf-city. A lot of hotel's parking places, not bad lobby bar in hotel with a several sorts of local beer. You can also make a cup of tea or coffee in the room. There are 2 Mercure's in Ratingen. This is the one in Lintdorfer Weg. Have been staying in this one over 50 times in the last few years. The hotel has been through serious restyling over the last few years (new bathrooms, new beds, hotel has been repainted, ...) Very good price quality balance (except when there are exhibitions in the Dusseldorf area room price is very high). The is a previous Novotel building which means that all room has a intermediate space between corridor and room which give an improved sound insulation. If you ask for a room on the parking site you can easily sleep with an open window. Good breakfast offer at acceptable pricing. good location. very good food and drinks. the room was nice and big with an evenly nice bathroom . Enjoyed the breakfast buffet as well as the people in the whole hotel. Receptionist, barmen, serveants... whoever... perfect. We often stay at the Mecure Hotel at Kelsterbach Frankfurt Airport before our flights, and sometimes over a weekend to discover the area. Staying at the Dusseldorf Mercure gave us the opportunity to compare them both. The hotel was undergoing building maintenance at the time,however this was managed correctly and did not interfere with our stay. The receptionist was very efficient and she gave us some good recommendations around the area. Being English, we do like a cup of Tea in the mornings, and missed the room facilities like Kelsterbach. Recently I joined the Accor Group Partner program a I thought that the hotels have the same standards. We booked this hotel and everything looked fine, only till 3 am in the morning a group of students were having a party in there room. I had to call te reception, but finally we didn’t slept after en 3 hours ride. I was really disappointed that the hotel allows this. We asked a quite room but we received a room in the middle of the hall between a group of students. Dear Kr1st0f84, Thank you very much for reviewing your stay at our hotel. We are happy to hear that you found our hotel nice. Unfortunately, part of your stay did not live up to your satisfaction as your sleep has been interrupted by noise coming from another room. First of all, we would very much like to apologize for this inconvenience. Please be assured, that we certainly do not allow parties in our rooms especially in the middle of night. We will do everything to avoid this happening again in the future. We hope we will be welcoming you again soon. Yours sincerely Anna M.
Dear Salvadords99, Thank you so much for your very positive feedback. I'm glad you enjoyed your stay again. It is nice to hear, that we could convinced you of our product and you visit us second time. We’re looking forward to welcome you again. Best regards, Anna M.
The behavior of the staff at the restaurant can be better. we have asked for warming up the milk of our 2y daughter and one of the lady was not interested at all and another told me that she needs to check with the kitchen. It took almost an hour for them to warm the milk.